Blue Imps - Blue Imps is a personal smurf collection site from Wales, UK. You can find pictures of all their smurf collection, facts and information about smurfs including markings, variations and fakes, links to many smurfy websites, smurf bulletin boards and much more! Beyond The Mushroom - A fantastic smurfy website from my good friend Graham. Also take a look at Martin Royle’s collection page. Hidden In The Woods - Moey's smurf collection that grows day by day. Take a look ! Kicking The Blues - A fascinating website dealing with smurfs way beyond just PVC figures. Schlurfs - Simon's Amazing Smurfs. A Wonderful Site both in German & English. Saussard.be - Featuring Xavier's large collection including promos, playsets and much more. Information about "Schtroumpf Passion" smurf fairs. JPP's Schtroumpf Site - Jean Philippe Paul's smurf collection showing off a wonderful selection of the different smurf mechandise that has been available. National Friends - A wonderfully designed site from England. Plenty of photos showing Stephen's impressive collection. Be sure to check out his SCCI smurfs. Bruno Beda - Check out Bruno's huge collection with many rare smurfy items. Also many hard to find items to swap and trade. Tiny Blue Tykes - A smurf website from down under showing Linda's great collection and her excellent homemade smurfy creations. Rae's Little Blue Guys - A new smurf website from Australia showing Raelene's growing collection and her list of wanted smurfs. Ösi-Schluuumpf - Probably one of the funniest smurf sites on the WWW. Very impressive collection as well as some hilarious "smurfy creations". Also plenty of serious information about fake smurfs from George and Lilly. Sgt Papas - Sgt Papas is an excellent resource from Australia for smurf collectors showing many many variations and excellent information on playsets and buildings. Also a huge selection of other smurfy items. XoioX2000 Kinder Smurfs - Probably one of the best resources for Kinder smurfs and Kinder smurf sets that is available anywhere. PVCBLUE.com - A new smurf website from Texas featuring lots of great photos of nice variations and rare goodies. Schtroumpfette - A amazing website from a very friendly smurfy collector Karyne. Aly & Ron’s Smurf collection - A fantastic website !!! Tine's collection - Tine her collection is amazing and i recommend everyone to have a look at it !!! Buddy Blue - Come and have a look to Hilary's website that grows and grows. Brads collection - A very nice website from our Australian friend Bradley who loves his plushes. Blue Paradise - Site about the famous sisters Véronique and Michelle who have a big smurf fair every year in Belgium. Kitty's Cavern - A great site that gives you alot of information about the smurfs !!! Karen is the best ! The Blue Collection - Ron's beautiful website with lots of pictures of fairs and his amazing collection. Blue Cavern - The Smurf Community - Blue Cavern is home of The Smurf Community. Many smurf collectors from all over the world chat and discuss smurfs here making it one of the friendliest and most useful resources to be found. Pete's Shroom Room - Pete's Shroom Room is a long established smurf forum. An excellent online resource with a huge archive of smurf information. Das Ultimative Schlumpfsammler Forum - A German smurf forum mainly concentrating on serious smurf collecting topics. 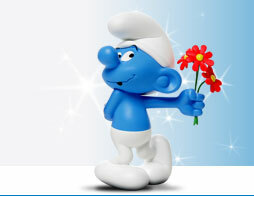 Schtroumpfpartie - Have a look at the french smurf forum. British Smurf Collectors Club - A recommended forum for everyone ! You can join the club and have some nice benefits of it. Gascher's Schlumpf-Sammler-Service - Formerly known as Smörfer's. Very large German online smurf shop, authors of "Der Schlumpf Katalog ". Mushroom Village - Complete smurf collectors resource. Shop, ID guide, excellent bulletin boards and plenty of information about collecting smurfs. Toydreamer - A great online shop located in Australia featuring all types of smurfy items from PVC Figures to Houses, Playsets & Sockels. There are even other types of Figurines and products available besides smurfs so have a look at what Andrew has available". SmurfToys.com - Smurf Shop in the USA". Toycollector - One of the nicest smurf sellers in the world and always a great selection of smurfs to choose from. Duckburg - Andreas marvellous online shop were you can find rare smurfs and more.